AUSTRALIA – Australian equipment provider tna has announced the launch of the tna roflo VMCS 3, the world’s first chip sizer that uses vibratory motion to separate large from small chips to maximise packaging efficiencies and speeds. The company says that the tna roflo VMCS 3 is ideal for a wide range of fried snack products, such as potato chips, and also fruit and other root vegetable chips. “Chip sizers play a vital role in maximising the speed and packaging efficiencies on small bag packaging systems,” comments Roger Treacher, Group Product Manager – Conveying at tna. “Ensuring that the right size product ends up in the right size bag is not only important for packaging performance, but also for end consumer satisfaction. Nobody wants to open their small snack bag and only find five large chips in it, or the other way around! The system’s unique pan design ensures that each chip is sized, sorted and gently transported along the line for a continuous product flow with minimum breakage. The new tna roflo VMCS 3’s interchangeable chip-sizing screens can be customised for various sizes to accommodate a wide range of ratios between small and large chips. Each screen can be easily removed within just a couple of minutes thanks to tna’s unique quick-release mechanism, offering snack manufacturers maximum flexibility over product sizing. The system’s simple, yet highly effective design further ensures that all parts are easily accessible to facilitate cleaning and maintenance procedures, reducing downtime and delivering superior equipment reliability. Contrary to conventional systems that employ rotary motion to separate the chips, the tna roflo VMCS 3 uses vibratory motion to limit maintenance requirements and gently convey product across a cascading chip-sizing screen, mounted on a shallow conveying pan. Smaller chips pass through the screen to the lower level and larger chips will continue on the higher level, each one continuing on separate conveyors towards their designated bagging station. The removable screen is designed in such a way that it maintains product quality and ensures no product blockages during sizing. Integrated product-divert gates can act as an effective bypass feature when sorting is not required. 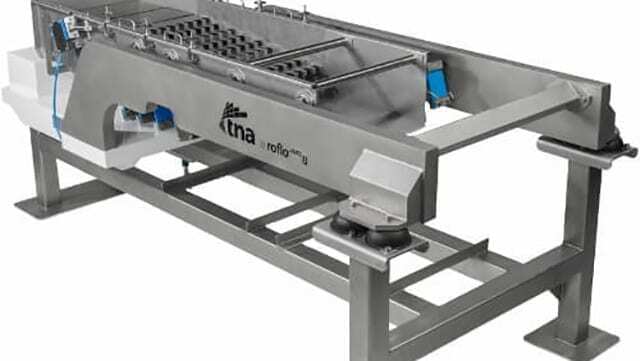 The tna roflo VMCS 3 is currently available in standard (600mm/24” width) and larger pan sizes (750mm/30” width) which can be seamlessly integrated with tna’s wide range of flexible conveying solutions, including horizontal and vibratory motion distribution systems like the tna roflo HM 3 and the tna roflo VM 3.